THIS DAY IN HISTORY: 1962 – John Glenn becomes 1st American to orbit the Earth, aboard Friendship 7. THIS DAY IN HISTORY: 1861 – Abraham Lincoln declared US President in Washington, DC. Time to Order Plants and Trees from the County Extension Office! A fabulous variety of plants and fruit trees are available to order for this year's planting season, through the Yancey County Cooperative Extension Office. See both of the attachments here for all the details, including a downloadable order form. THIS DAY IN HISTORY: 1865 – Congress passes the 13th Amendment, abolishing slavery in America. These two images are from the January and February 'events' sections in Carolina Country magazine. 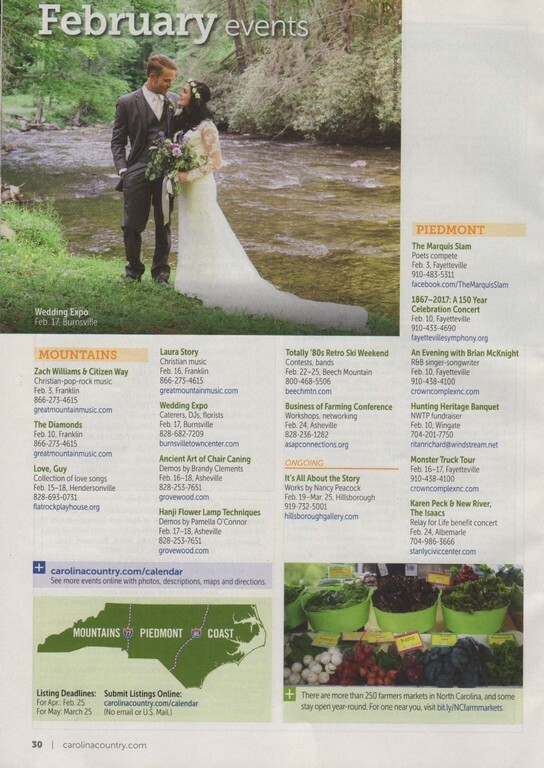 Yancey County received the lead photo in the events section in both issues, for the First Day Hike at Mount Mitchell in January and the Burnsville Wedding Expo in February. The circulation for Carolina Country is more than 700,000.